OLGA LAH DID NOT start out wanting to wrap buildings in electrician’s tape, fill huge spaces with billows of crumpled paper, or line galleries with great swathes of plastic bottle caps. She did not set out to be an artist at all—let alone one catching the attention of the art world in Los Angeles and even Europe. But, ten years after graduating from college, this is what she has become. PLATE 14. Olga Lah. Array, 2011. Sponges, storage pod. Torrance, California. All photos courtesy of the artist. 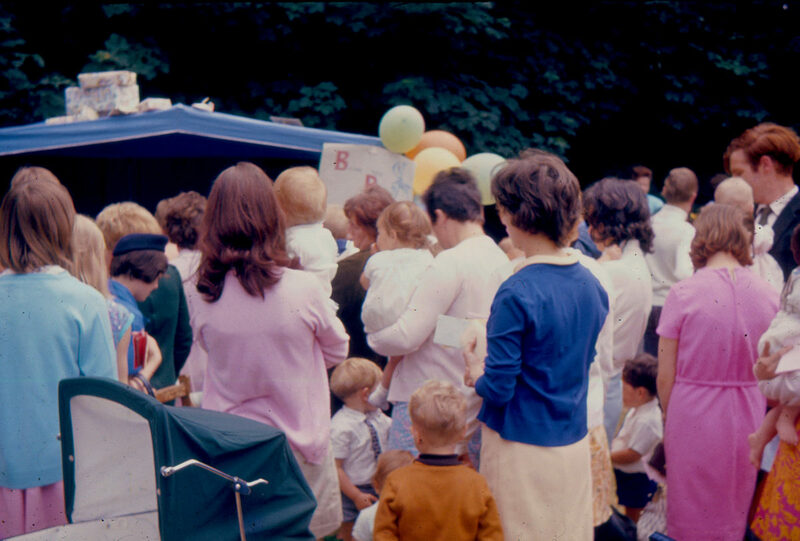 Early in 2011 an art-fair curator approached her about a possible installation in a storage pod. Accustomed to looking for clues in the spaces where she imagines her site-specific work, she found herself excited rather than intimidated: imagine the possibilities of such a space. Imagine opening a pod to discover, not an attic-like collection of dusty furniture and old suitcases, but a seething wall of…sponges. The result was a concatenation of four thousand sponges, pressed together, filling the space and crowding the viewer [see Plate 14]. She was similarly intrigued when, in 2013, Gallery 825 asked her to wrap its building for a solo show sponsored by the Los Angeles Art Association. Though exigencies of weather and materials forced a postponement of the piece, the invitation signaled that Lah had caught the attention of the Los Angeles art world. How has this soft-spoken, second-generation Korean American woman come to make such attention-grabbing statements, and in such a short time? Although she was always drawn to art, Lah did not originally imagine herself as an artist—a career that did not fit into her own or her family’s plans for her life. After graduating in 2002 from the University of California, Riverside, with a BA in studio art and art history, she thought she might become an art educator. She was accepted into a master’s program at Harvard but had to decline admission to stay home and care for her elderly father. After working in various art education jobs that proved unsatisfying, she wondered if she should be headed for some form of Christian ministry, and so she enrolled in a master’s program in biblical studies at Fuller Seminary. Maybe this would lead to further study, she thought, even a PhD. But after finishing her masters in 2006, she had not found the motivation or spark to move forward, so she returned to arts education, but still felt unsatisfied. Having recently married, she moved briefly to northern California, where her husband, a gastroenterologist, was offered a job with Kaiser Permanente. After they returned to Los Angeles in 2009, she audited a travel course in Italy sponsored by Fuller, and there she found answers to the big question that hovers over the arts for many Christians: why is art important? Despite her love of art, this question had troubled her. In Italy, she realized what art can do—how it can move people, awaken them to something beyond what they see and touch. Indeed she saw the ways it had furnished spaces of worship and attracted believers to prayer and praise through so much of Christian history. 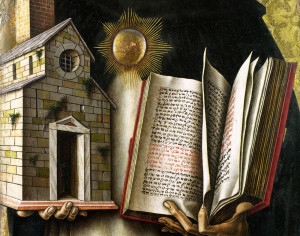 The work of Signorelli and Giotto inspired her to start drawing and, later, to make pieces that bring spaces to life. From her earliest attempts, her work has been about transforming ordinary materials and plain spaces. For the class, she made a series of sketches on paper of Signorelli’s frescos that she made to float in the air, as though they were being lifted by some invisible force. PLATE 15. Olga Lah. Translation, 2010. Paperback books. Biola University Gallery, La Mirada, California. With the support of her husband, she decided that she would devote herself to making art. She had found her calling. That year for exhibitions at Fuller and later at Biola University, she did her first major installation, Translation, a large-scale collage of open paperbacks climbing a wall, inviting viewers to become participants—readers—and creating a space that is open and embracing [see Plate 15]. She was thinking of life as a narrative and the need to “translate” one’s experiences. 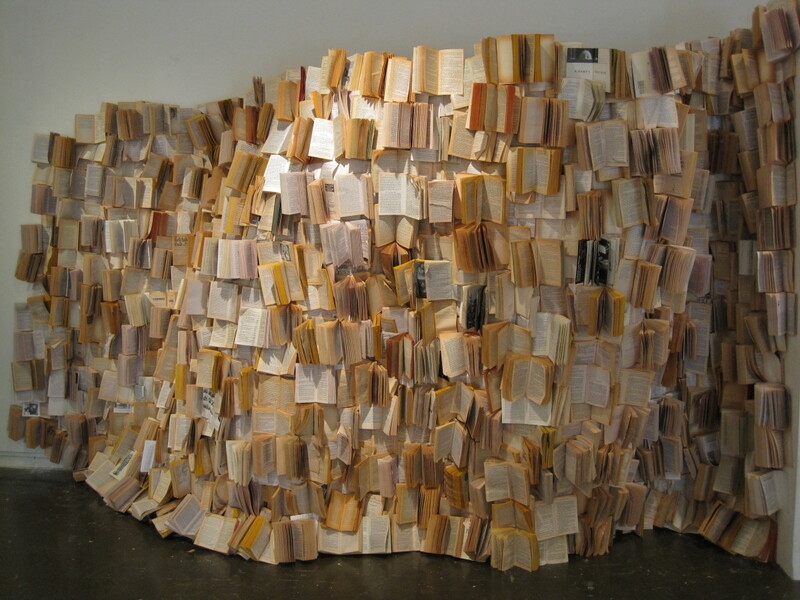 The uneven surface of the wall moves in and out, with the books’ pages fanning out, suggesting that translation is haphazard: on the journey of life, one cannot take everything along. This was the first of what would become increasingly bold pieces that embrace and energize ever larger spaces. When I asked her what led her to scale up her work, she said, “I wanted to make the viewer feel encompassed.” Because she is a quiet person, she says, she sought a form of expression that had a “strong and dominant voice through size.” She revels in making large spaces speak. The result, like much of contemporary art, has to be physically experienced. It can hardly be captured in words and photos. PLATE 16. Olga Lah. Climb In Climb Out, 2011. Bed sheets, computer monitor. Judson Studios Gallery, Los Angeles, California. During this time she received a series of awards and much critical attention, both local and international. In 2013 she was accepted into a residency program in Florence, where she exhibited in a church, La Macina di San Cresci. 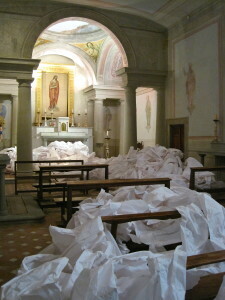 The San Cresci installation, Horizontal to the Vertical brings together several of Lah’s interests and strengths: the alchemy she performs with ordinary materials—here, masses of rumpled white paper—her preference for large spaces, and especially her spiritual intent to suggest something beyond the ordinary [see Plate 17]. 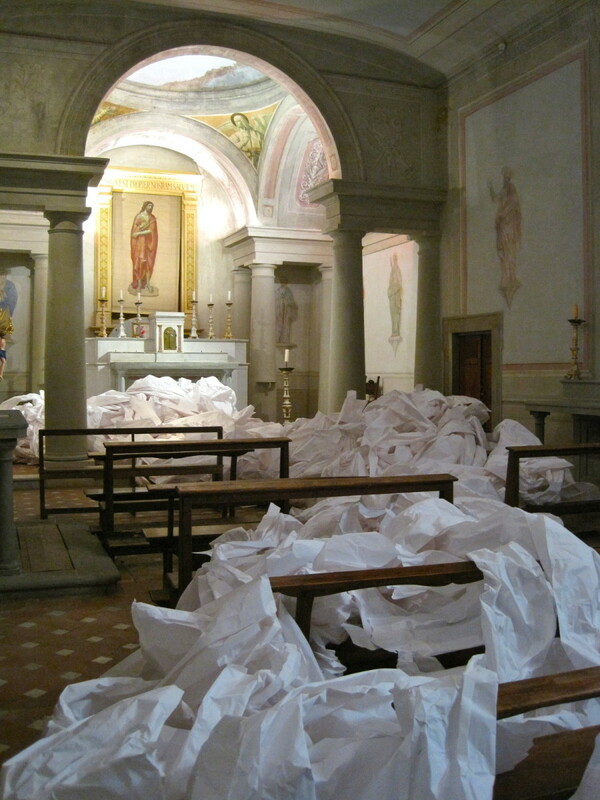 From the beginning, she reports, she wanted to connect a contemporary piece of art with a traditional church environment—in this case the oldest church in the Chianti region. She also wanted to reflect the Carthusian idea of the horizontal leading to the vertical, and that, in turn, leading to a widened horizontal. She wanted the viewer to see the space in a fresh way. “My aim was to move the eye up and down in flux, mirroring a contemplative life of moving actively between natural and spiritual.” The lower part of this baroque space—complete with columns, paintings, and elaborate candelabras—is covered with large masses of white paper spreading over the pews and encircling the altar. Here this most common of materials becomes the horizontal that holds out its hands, as it were, to the vertical space and its implicit transcendence. PLATE 18. Olga Lah. 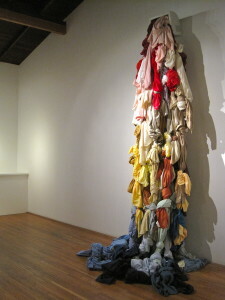 Ascension, 2012. Fan trellises. Boston Court Performing Arts Center, Pasadena, California. Lah created a similarly evocative installation for a large theater space in Pasadena, Ascension [see Plate 18]. The idea for this piece came to her in the garden section of Home Depot, where she came upon fan trellises with their uniquely suggestive shapes. When the opportunity came to work in the large stage of Boston Court Theatre in Pasadena, she immediately thought of those trellises. Initially she was going to have them hang in mid-air, but during the installation she realized that attaching them to the floor would add a sense of thrust and movement. 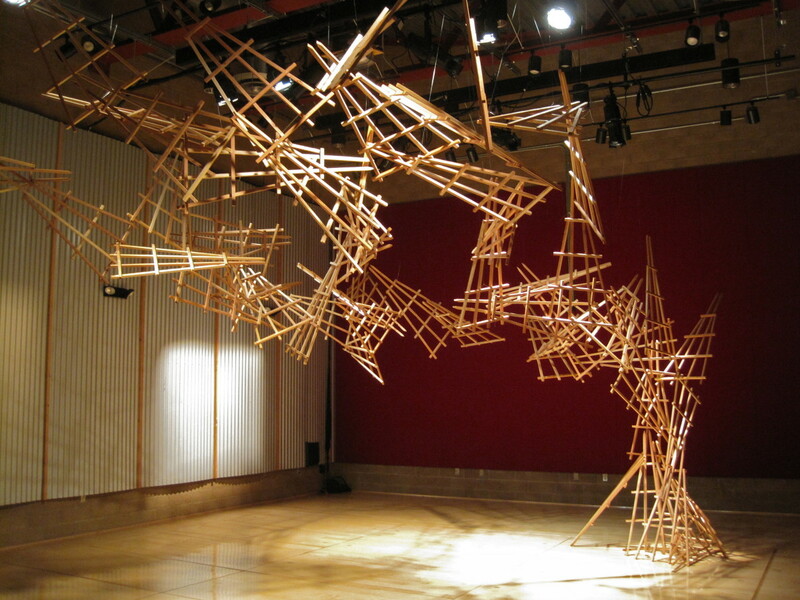 The result is an exploding array of trellises, which do not simply articulate the space, but expand and lift it up before our very eyes, moving out from our reality into an “intangible, untouched space.” As the title implies, the piece embodies Lah’s commitment not only to reframing space and remaking her materials but also to shaping transcendent gestures in the most ordinary spaces—here referencing Christ’s own translation from this reality to a place beyond. Lah has eagerly participated in the vibrant Los Angeles art scene and acknowledges many contemporary influences—she credits especially Tokujin Yoshioka, Richard Serra, Lynn Aldrich, and Christo and Jeanne-Claude with playing a role in the evolution of her work. She admires the spirit of purity in Yoshioka’s experiential work, and the way Serra makes the viewer feel his objects’ assertive physicality while walking around or through them. 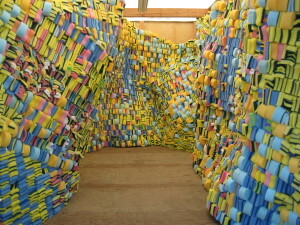 One sees Aldrich’s influence in Lah’s choice of common and compacted materials like sponges, bottle caps, and ribbons, especially in works like Array. But Lah pointedly wants to multiply these materials to create a space that is at once intimate and monumental. Christo’s well known transformations of urban and rural landscapes impressed her with their temporality and their “minimal yet impacting aesthetic.” Very recently she has been moved by the work of James Turrell, who, she notes, uses “light to move the viewer into deeper perception of our surroundings, but also of our inner Spirit-filled world”—a response which may suggest a new direction for her own work. In addition to contemporary influences, her background in art history has also clearly played a role in her development. The twentieth-century tradition that stretches from Dada to pop art appears especially pertinent. In a blog review, Jim Watkins of Saint Andrews University in Scotland contrasts her work with Marcel Duchamp’s readymades, which made similarly transformative use of ordinary objects and materials. And the comparison bears further reflection. Duchamp’s choice of everyday material, despite its humor and playfulness, had a very serious intent: he sought to de-essentialize his materials. As he put it: “I don’t believe in the word ‘being’…. [I]t is an essential concept, which doesn’t exist at all in reality, and which I don’t believe in.” It was this impulse, rather than simply his use of materials, that came to play such a large role in twentieth-century art. But Lah’s use of ordinary materials works to a very different, one might say opposite, purpose, as though Duchamp were turned on his head. Her ordinary objects are not deployed as an erasure of meaning, nor are they meant, as with Duchamp, as a witty commentary on art and art making. Rather she intends to affirm their materiality and even their fragility—“I am comfortable with the temporal,” she notes—and even to make this common stuff into a portal to something more substantial. Lah’s work similarly appears to reference pop art and its celebration of everyday objects. But here, too, she overturns the impulse of pop art. Though Jasper Johns’s early work exhibits a vague anxiety about the objects he uses, later he achieves a bland indifference, what has been called a neutrality tinged with irony. Unlike Johns (or Warhol), Lah accepts the materials she uses without irony, even with a kind of gratitude, as though they were expressions of some benevolence. This theme of objects coming alive, taking flight, spreading out of their boundaries, has come to play as significant a role in contemporary art as it has in ecology—one thinks of artists like Antony Gormley or Eduardo Kac, and of the alarming growth of jellyfish in the world’s oceans or the multiplying Asian carp in the Great Lakes. But Lah wants to challenge, or at least nuance, this concern, and to suggest that growth is meant in the first instance to be a blessing, not a curse—something that we should receive with gratitude. PLATE 19. Olga Lah. Propagate, 2012. Pill bottle caps. Huntington Beach Art Center, Huntington Beach, California. A good illustration is a major piece from mid-2012. That summer Lah was asked to join two other artists at the Huntington Beach Art Center in a show perfectly suited to the trajectory of her work. It was entitled Escape from the Landfill and was meant by curator Darlene de Angelo to alert viewers to all that we discard in our lives, and the implications of the resulting waste. Lah’s piece, Propagate, consists of white, yellow, blue, and green pill bottle caps that spill over the walls and ceiling of the gallery, beginning in the lobby, gathering and dispersing until they come together at the back of the gallery [see Plate 19]. Along with finding inspiration at Home Depot, she also sources her materials from Trash for Teaching, an organization that rescues leftover and defective manufactured items from landfills and reuses them for educational purposes. 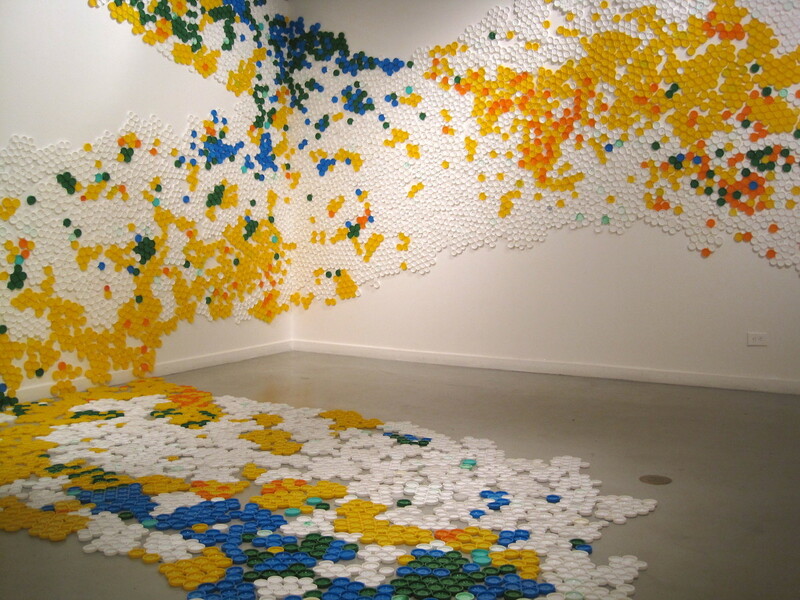 For this piece, she purchased forty thousand plastic lids to create her largest installation yet. Lah’s ambition is not for the faint of heart. Two themes permeate Lah’s work: the ordinariness of the stuff of our lives, and its resulting temporality. Her work highlights, even celebrates, the significance of the physical. And she has a soft spot for quotidian materials—which she thinks makes art accessible to people who might not otherwise enter a gallery. But the magic of her work lies in the way this common material can be brought to life, transforming itself and forcing us to experience physical objects, and our own physicality, in new ways. She admits there is a certain risk associated with using such material. It is often recalcitrant—the recent plan to wrap a building had to be abandoned when the adhesive failed to stick properly. And her projects are time-consuming to construct and install. For Propagate, teams of volunteers spent days installing the waves of bottle caps, and she recalls driving home alone one night, exhausted and hungry, wondering about the life of an artist. A similar risk is associated with the work’s temporality. An art of the ordinary, made for the moment, would not suggest a classic stability on which a large reputation may be built—her work is as difficult to sell as it is tedious to install. The energy and vitality that she manages to create is mostly over in a moment, or at most a few days or weeks. Then it is dismantled and stored in her garage. But Lah does not mind. The work’s fleeting nature is part of what excites her and moves her into ever larger and more ambitious projects. I think I’m working toward creating a new visual language and not trying to be this overarching evangelist…. I really don’t like art that’s so obvious and tries to take the message and put it right in your face. I’m not trying to push an agenda; it’s more an exploration. I want people to dig deeper in themselves, to ask, what is the experience? What am I feeling? Is this pointing to another reality? There is a certain tension between the commonness of Lah’s materials and the scale on which they are deployed. This juxtaposition is part of what gives her work its energy. She spends a lot of time reflecting on the materials and the space where they will be installed, because she wants to bring out something of the potential of these. When I asked her whether making art has played any role in her own spiritual life, she noted that it has taught her to listen, to pay attention. She often sits quietly reflecting not only on the place and the materials, but listening for the Spirit. When all attempts at analysis and description are finished, Olga Lah’s special gift to us remains: she helps us to pay attention. Lah demonstrates that when one listens with gratitude, reality can become a kind of sacred space. Reality itself can become a revelation. 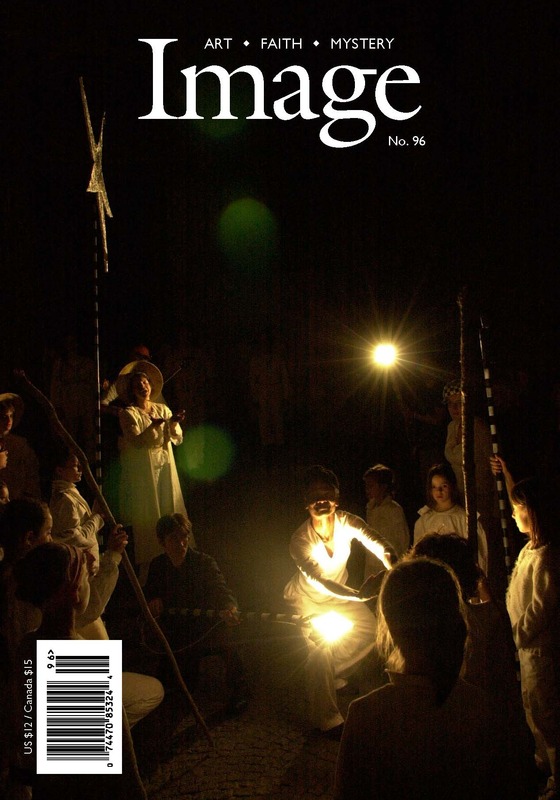 Martin Heidegger was referring to the gift of art when he wrote, “the being of beings is lit up in and through an appearance.” As Stephen Garrett notes, quoting Heidegger, but in words that apply well to Lah’s work: “art projects a world in which we are invited to enter; and, in that way, ‘art breaks open a place, in whose openness, everything is other than usual.’” In the space Lah creates, everything becomes something other than usual. Such revelations occasion reflection on why it took so long for Lah to answer the big question of why art is important. What is it about Christianity that sometimes obstructs the clear call that Jesus makes, with such obvious affection, to “Pay attention to the lilies; watch them grow”? Is it perhaps the inclination to privilege the spiritual, and, in the process, demean the physical—another byproduct of Christianity’s Platonic heritage? Whatever else it does, her work demonstrates the mistake in this. Perhaps it also points to the way “the firmament proclaims [God’s] handiwork. Day to day pours forth speech” (Psalm 19), and it might even give some evidence of the transforming visitation of that creator God in Jesus Christ. Lah knows that not everyone will see this sustaining and gracious presence that undergirds her work and that she intends to evoke. But this does not keep her work from becoming a kind of offering. Like a priest lifting the elements, her work fashions its own sursum corda: lift up your hearts. Lah does not insist on this because as she pursues her work something else matters: “I think I am finally doing what I’m meant to be doing,” she reports. “This is exactly what I should be doing with my life.” For an artist, that is blessing enough.